Say hello to Sarge! Sarge is a Boxer mix who is approximately 7 years old (as of 3-28-17). He is heartworm positive, but is being treated. 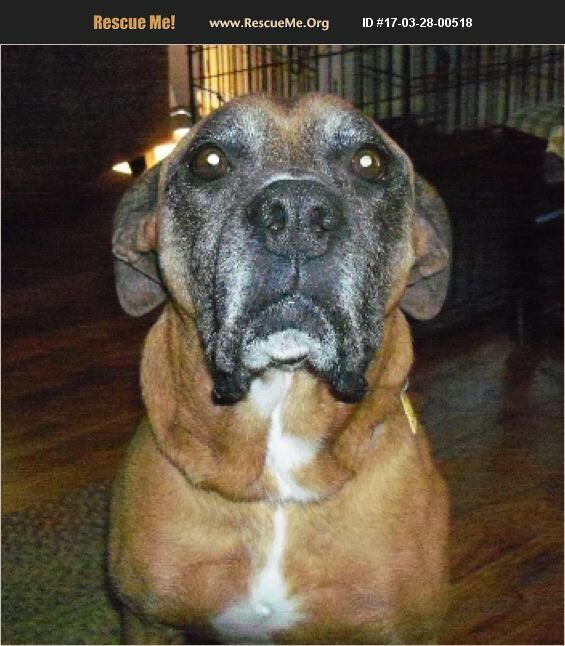 Sarge does well with other dogs, but needs a home without young children. He does not like to be grabbed by the collar. We aren't sure why, but this makes Sarge uncomfortable. Sarge is a really nice fella and would love to have a home and family of his very own. If you would like to make Sarge's dream come true, contact RARE today! **An application and home visit are required. Transport can potentially be arranged to approved homes. Please ask us for more information if you are not in Tennessee** **All of our pets are or will be spayed/neutered, up to date on all vaccines and micro-chipped prior to adoption. Please complete the application on our website and we will call you to answer any questions you may have. ** Our adoption fees not only help the animal being adopted, but they also help to cover heart-worm treatments and other treatable ailments that many animals, that would otherwise be euthanized, need to be made available for adoption. Thank you for choosing to adopt, foster, or aid in the rescue efforts of RARE! *****AN APPLICATION AND HOME VISIT ARE REQUIRED***** Please visit www.RuralAnimalRescueEffort.org for foster and adoption applications or for additional information. ***Please Note*** The breeds noted are guesses on the part of the volunteers of RARE based on the physical characteristics of the particular animal. We are not breed experts; therefore, the noted breeds may not be correct.